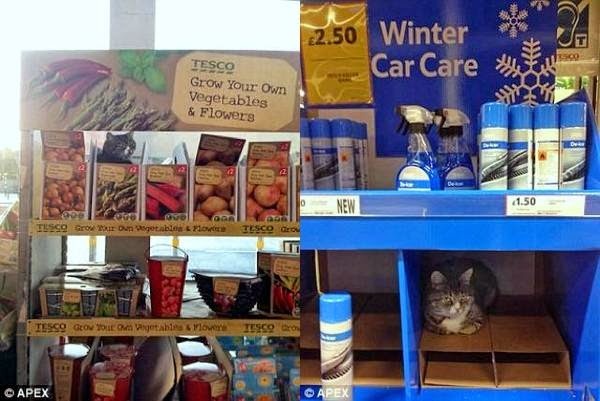 If you're ever in Tiverton in Devon, England, then make sure to visit the local Tesco store to meet Mango the supermarket cat. Though he has a home nearby, Mango has been sleeping inside the supermarket for four years now. He loves to pose for pictures. P.S. Similar pictures of another supermarket cat here. Mango picked a great store to hang out. Forgot to say at my heaviest I was 5.8kgs. The silly nurse was telling Mummy I needed to be about 4.5kgs which Mummy said was stupid given I was a large cat. Thankfully we are no long with that practice. Wow Mum's been using that winter car care from Tesco and she gets all our food from there as they have a great selection. She also wishes they had a Mango there so she could do scritches for him. How adorable! 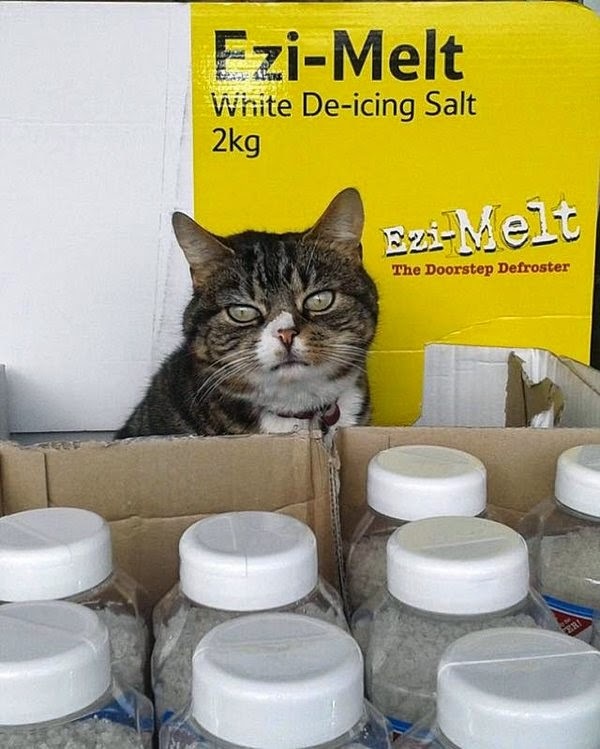 We think every market should have a resident cat! How cute but sadly now Mango has been evicted for Health & Safety reasons. 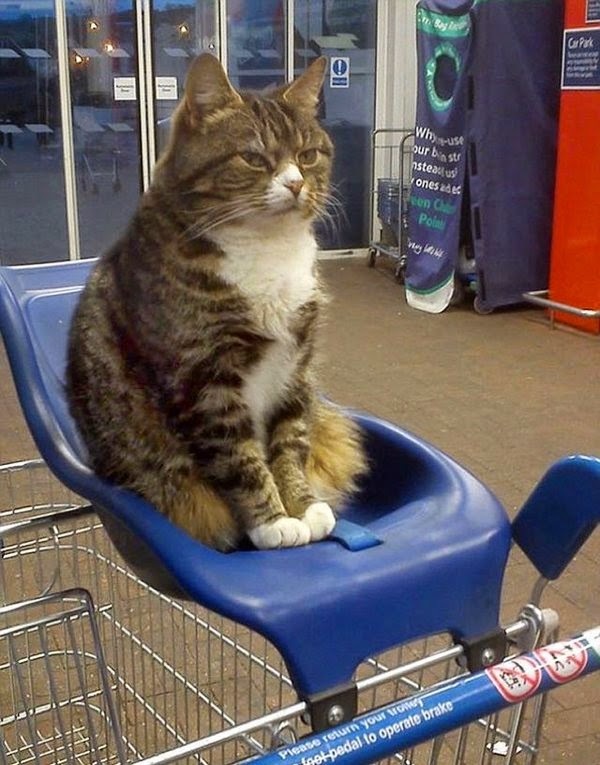 We sure do wish there were supermarket cats here in the States! Awwww! He is sweet, and unusual looking too. We have a similar cat not far away. He lives in a house by a garden center, but prefers to hang out at the garden center all day and get petted by the customers. When they close at 5:00, then he goes back home. I love these poses you got! Mango is such a cute kitty! How nice supermarket set his house even though he has home nearby :-) Love the 2nd picture. Too cute! oh my gosh, how adorable, especially in that cart! 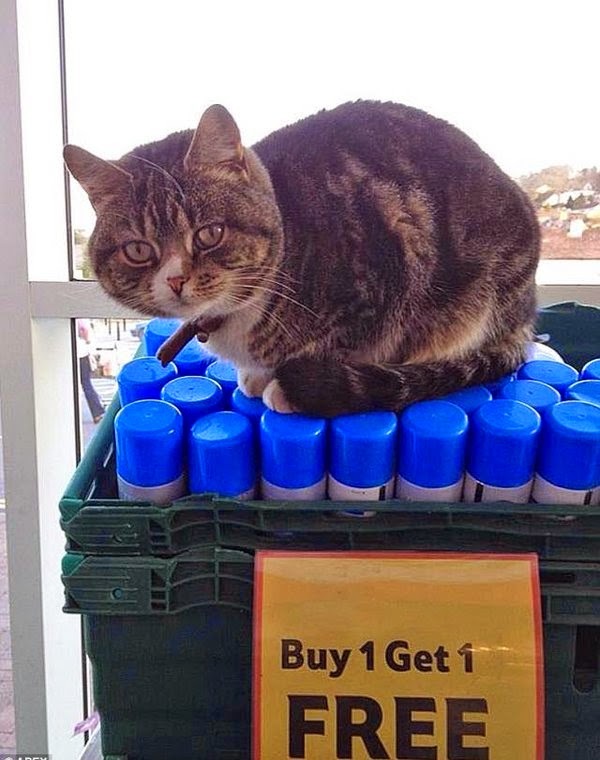 Aww man I wish my local Tescos had a cat like that. It's pretty awesome they let him stick around and stay there. Plus it totally endorses my idea that cats should be allowed in supermarkets because the signs only say "no dogs". That sure is a sweetie! We hope no one ever complains and gets him tossed out because it's just great to have a store mascot! So adorable! I love cats who work as retail store managers. I personally know one who managed a card shop in Winnipeg and another one who ran a bookstore. Oh, and several in Maui who run a car rental business. Mango is so cute! I love the sign about his home. :) It looks like he really enjoys being at the market. So adorable and how fun he's named Mango and stays in a supermarket. 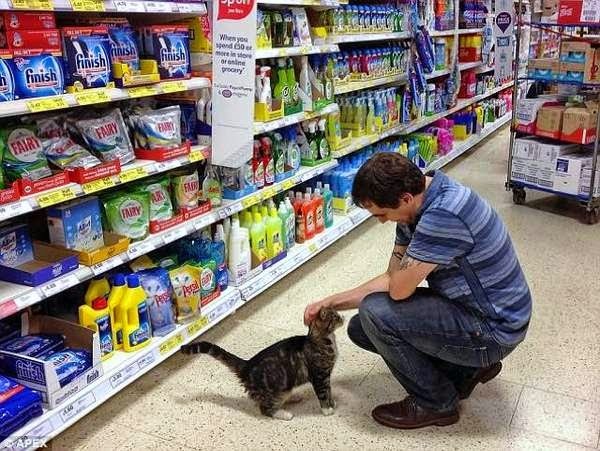 I would go shop there if only to say hi to that cat! anda soooper grate nite two ewe mango; meowloz frum all oh uz in de land oh trout ! How cute. Would love to see something like that here! They wouldn't go for that here though! Mango is adorable! I hate grocery shopping & would love to be distracted by a cute kitty cat!! Love the kitty in the child carrier on the shopping cart! Mine would never sit there! Beautiful cat. I'd like to shop there. I love stores with resident animals. It makes them feel like they're places that really care about quality of life. How fun! It would be fun to get a pic with him! Wow! I'm not a cat person, so I have to admit this is a little beyond my comprehension! This is so funny and cute! I'd love to have a supermarket kitty where I go grocery shopping! That mango is a very handsome boy. 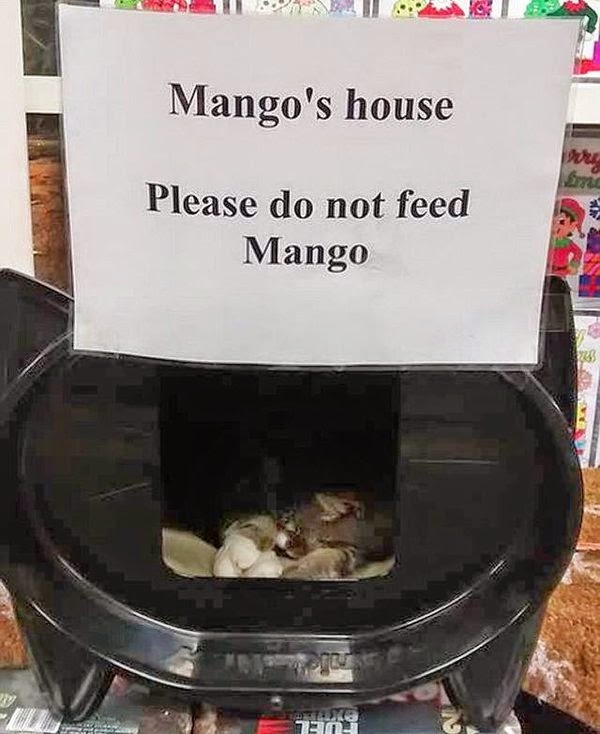 The people in the store must take good care of him that he lives there. What a cutie he is. He's absolutely adorable.........he probably loves people and gets more visitors/pets at the store than he does at home! What a darling cat! Purrs from Deb and the Zee/Zoey kitties! Un chat bien sociable .. OMD!!!! That is so cool! hahaha oh my gosh. That is hilarious! What a fun thing. That is hilarious. I wouldn't have guessed a super market. This is such a great story! & that cat looks so cute! Tiverton, Devon is my part of the world. How have I never heard of this cat before?! How funny! He has such a funny grumpy face! The cat sitting the baby sit was cute. They have a mascot. This cat is the cutest little thing ever. This might be my new favorite blog. These cats are the best. How funny! He has a home, but chooses to sleep at the supermarket. That photo of him in the shopping cart seat is so cute! Oh I just love Mango! He's so cute! Et ce chat n'est pas à vendre !!!! He is a cute cat and I love his name!